There's hardly any new cars on show here in Detroit, but don't worry, journalists that rely on the car industry to feed them have found another way to justify their meal tickets. Apparently, the big story this year is "optimism." "A new sense of optimism filled the Detroit auto show Monday," writes the AFP. 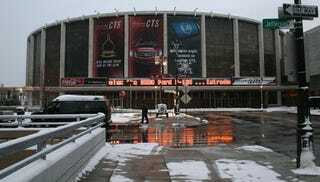 "Optimism reigns in Detroit as big auto show begins 2-week run," says the AP. "Detroit auto show does without glitz, but there's a sense of optimism in the air," barfs the Pittsburgh Post Gazette. In fact, a Google News search for "optimism detroit auto show" returns 741 results. What do we have to be optimistic about? According to the AP, Chrysler is going to slow the rate at which it fires people (they're calling that "hiring"), Ford won two Car Of The Year awards by the hometown press, GM's going to make more crossovers, Chrysler/Fiat will hire temporary employees instead of full-time ones when it eventually gets around to importing cars like the Chrysler Guido and the company announced it hadn't lost any more of its cash reserves since November. We didn't realize there was free crack on offer here at the show, but as soon as we finish writing this article, we're going to go find some. As apparently the only non-high journalists in attendance (we'd describe our state more like "buzzed") we just don't understand where this optimism is coming from. Dodge, Jaguar, Jeep, Land Rover, Lexus, Lotus, Maserati, Mazda, Mitsubishi, Ram, Scion, Smart and Volvo aren't even holding press conferences as they have nothing new to blather on about — not even a dumb radio.Lamborghini, Porsche, Nissan and Infiniti didn't even bother to show up. As far as we can tell, the only all-new production models here are the Ford Focus and the Honda CR-Z. Most of the "unveilings" are for products we've seen before or they're just relatively un-exciting concept cars. Journalist attendance is noticeably down from 2008, not to mention 2007 — both years with three press days. This year, they can barely manage one and a half. Also, it's 16 degrees outside and there's very little in the way of free beer. I hate this place.